Would you make your child clean up at 18 months old? /Would you make your child clean up at 18 months old? How old were your children when you began to give them responsibilities around the house? For most parents, the answer is likely to be somewhere around a child’s early teenage years. 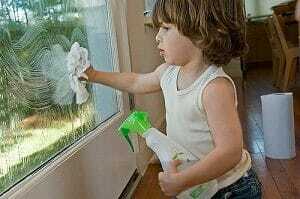 However, according to one doctor, children should be able to do basic chores from the age of just 18 months old. Surely that’s very young? Is 18 months too young to start cleaning? It’s Dr Deborah Gilboa, an American child development specialist, who believes that toddlers should be able to complete some chores for themselves, Heart reports. At this age, children are often given toys to play with that are miniature versions of household appliances, such as ironing boards, mini hobs and even vacuum cleaners. They learn a lot at this age by copying adults and love to feel like they’re helping by ‘joining in’ with chores. “This is the ‘me do it myself!’ age, so take advantage of it,” Dr Gilboa said. She suggests giving toddlers basic household jobs to do, such as dusting or sweeping, where there’s no risk of them hurting themselves, they’ll learn some new skills and be giving you a helping hand around the house. But should kids just be allowed to be kids for at least a few years? If that’s your opinion but you still feel like you need some extra support cleaning, hiring in a professional cleaning company like us to take care of the chores for you will take that burden away from your little one! When should kids start doing chores? While 18 months does sound far too young for children to be doing the housework, almost reminiscent of a Victorian pauper situation, when exactly should kids start taking on some extra responsibilities and joining in with the housework? But is this really necessary? While on the one hand it’s important to teach children about responsibilities and to show them that it takes work to keep a home clean and tidy, on the other they deserve to be allowed to play, concentrate on their homework and have time to spend on their hobbies too. Doing chores might help to build their character like Dr Gilboa says, but so will getting the opportunity to find their own interests and play creatively. The best time to introduce chores to kids may be when they begin to show an interest in buying things for themselves, or are begging for extra sweets or toys. Having to earn the money to spend on these things for themselves by doing jobs around the house is a great way to teach them about the value of money and responsibilities at the same time. It also means their participation in housework has been somewhat self-directed and you’ve been able to talk about it together, rather than making them sweep up from toddlerhood onwards.